The PA has made engaging in terrorism far more lucrative than pursuing productive employment. Dr. Alex Grobman is a historian and author of The Palestinian Right To Israel (Balfour Books, 2010). He co-authored "Denying History: Who Says The Holocaust Never Happened And Why Do They Say It?" (University of California Press, 2000). His newest book is License to Murder: The Enduring Threat of the Protocols of the Elders of Zion. Those who have watched what passes for the Middle East peace process between Israel and the Palestinian Authority have long recognized that there can be no peace until there is a complete renunciation of violence and terror as substitutes for negotiations. Now, thanks to President Donald Trump’s special Middle East envoy, Jason D. Greenblatt, an equally valid corollary has been acknowledged: There will be no peace until the PA ceases its practice of financially rewarding terrorists and their families. Last month, as punishment for the PA’s policy of continuing to pay stipends to Palestinian-Arab prisoners and to families of those terrorists who have been wounded or killed, the Israeli Security Cabinet announced it would suspend approximately five percent of the monthly funds the Jewish state transfers to the PA from specific taxes Israel collects from Palestinian Arabs. This is the first time the PA is being held accountable for allowing financial support to flow to families of convicted terrorists who are either incarcerated in Israeli prisons or have died while murdering Israelis. For years, Palestinian Arab terrorists have known that whether they are killed in action or incarcerated in Israeli prisons as a result of their crimes, their families will be compensated by the PLO, Hamas, Islamic Jihad, and/or other Palestinian-Arab terror organizations. According to Yossi Kuperwasser, former director general of Israel’s Ministry of Strategic Affairs and head of the Research Division of IDF Military Intelligence, monthly salaries for families of killed or incarcerated Palestinian terrorists range from 1,400 shekels ($390) to 12,000 shekels ($3,300), funds which are taken as part of the PA’s general salary budget that includes civil servants, military personnel, and others. It is not seen as payment for social services. In 2017, the average terrorist salary, including benefits, was about $177 more than the $213 per month received by the PA’s 118,000 welfare recipient families. Israeli journalist Evelyn Gordon explained that the lower amount is comparable to the average—not minimum—wage for Arab workers in Judea and Samaria and about 40 percent higher than the average salary in Gaza. The higher numbers, she said, represent salaries most Palestinian Arabs cannot even dream of achieving. This means the PA has made engaging in terrorism far more lucrative than pursuing productive employment. None of this is new. In Humanitarian Rackets and Their Moral Hazards: The Case of the Palestinian Refugee Camps in Lebanon, a 2016 exposé of the corruption and economic fraud that is rampant in Palestinian refugee camps in Lebanon, author Rayyar Marron of the Australian National University School of Archaeology and Anthropology explains that, in 1964, Fatah, the Palestinian nationalist movement founded by Yasir Arafat, was established to provide financial support to families of “martyred,” disabled, or apprehended Fatah terrorists. According to Ms. Marron, the fund was later transferred to the Palestinian Liberation Organization and became known as SAMED (Palestine Martyrs Works Society). By 1980, SAMED had dispensed pensions and social services to 20,000 families associated with terrorists. By 2017, that number had risen to 33,000. According to journalist Bassam Tawil, the support by these terror groups is designed to demonstrate the ’ profound appreciation for individuals who elect to “sacrifice” their lives, and this gratitude is intended to inspire others to enlist in the war of destruction against Israel, secure in the knowledge that the children and families of those prepared to die as “heroes” and “freedom fighters” will be provided with financial sustenance. Terrorists killed in action are lauded in the PA-controlled media where well-publicized reports of their actions are carried. They are given elaborate funerals at which their photographs are prominently displayed. With this sort of approbation, it is small wonder that it has become common for young Palestinian-Arab men and women to vow to forfeit their lives while murdering innocent Israeli civilians. According to Steven R. David, a professor of International Relations at Johns Hopkins University, some of this is mere theatrics, but there is no denying that dying to free “Palestine” has become, for these young people, a badge of honor. Palestinian Media Watch (PMW), an Israeli research institute that studies Palestinian Arab society from a broad range of perspectives by monitoring and analyzing the PA through its media and schoolbooks, has thoroughly documented the relentless glorification of terrorists which, PMW says, reinforces the culture of hatred against Jews. When public squares, towns, and cities are named for terrorist murderers, the terrorists’ actions are elevated to the level of heroic acts of “resistance,” said PMW director Itamar Marcus. 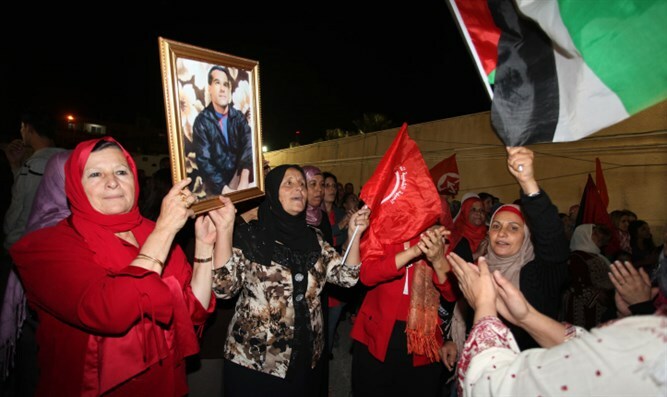 The Palestinian-Arabs and their supporters show no signs of interest in ending their glorification of terrorist-murderers. According to the Jerusalem Post, at a recent closed-door UN Security Council debate, initiated by Kuwait and Indonesia, over the Israeli freeze of funds to the PA as long as they continue to reward terrorism, Mr. Greenblatt tweeted what seemed to be his message to the 15 members of the council: “If your citizens were being routinely attacked by terrorists, which of you would tolerate a reward system that compensated the attackers for their crimes? How can we possibly censure Israel for taking the same stance?” he wrote. It is an argument that holds no water for most Israelis and their supporters. It seems clear that as long as the PA is rewarded for its intransigence in its demands and tactics, including its ongoing incitement against Israeli citizens, and no one is willing to hold Palestinian leaders accountable for continuing to provide financial support to families of convicted terrorists who are incarcerated in Israeli prisons or who died while murdering Israelis, any hope of peace will continue to be an illusion. Dr. Grobman, a Hebrew University-trained historian is the author of many books on Israel, antisemitism, and Jewish affairs. He is a member of the Council of Scholars for Peace in the Middle East (SPME).